Le Puy-en-Velay is a commune in the Haute-Loire department in south-central France near the Loire river. The city is famous for its cathedral, for a kind of lentil, and for its lace-making. Le Puy-en-Velay's most striking attraction is the Cathédrale Notre-Dame du Puy, dating chiefly from the first half of the 12th century. The façade, striped in courses of white sandstone and black volcanic breccia, is reached by a flight of sixty steps, and consists of three orders, the lowest composed of three high arcades opening into the porch, which extends beneath the first bays of the nave. 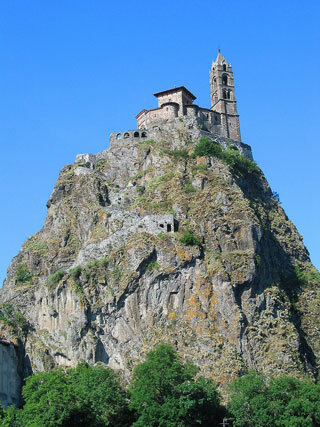 This article uses material from the Wikipedia article "Le Puy-en-Velay", which is released under the Creative Commons Attribution-Share-Alike 3.0 License.